Five women's and three men's teams from Northern California received bids to the NCAA Division I Tennis Championships on Tuesday. The women's field features No. 7 Cal, No. 12 Stanford, No. 40 Saint Mary's, No. 66 San Jose State and unranked Sacramento State. The Bears, Cardinal and Gaels gained at-large bids in the 64-team field. The Spartans and Hornets earned automatic bids by winning the Western Athletic Conference and Big Sky Conference tournaments, respectively. The men's field includes No. 18 Cal, No. 41 Stanford and unranked Sac State. The Bears and Cardinal received at-large invitations in the 64-team draw, while the Hornets snagged an automatic bid by capturing the Big Sky tourney. In the women's bracket, Saint Mary's (13-9) will play No. 21 Auburn (18-8) at Cal's Hellman Tennis Complex on May 10 at 10 a.m., following by the Bears (16-5) against unranked Stony Brook (12-4) at 1 p.m. The winners will meet on May 12 at noon at Cal. The Stanford women (16-4) will host unranked Miami of Ohio (13-12) at Taube Family Tennis Stadium on May 10 at 2 p.m. The winner will play either No. 20 Rice or No. 62 Pepperdine at Stanford on May 11 at 1 p.m.
On May 11 at USC, the San Jose State women (19-5) will take on No. 31 UC Irvine (22-4) at 9 a.m., followed by the Sac State women (13-13) vs. the host Trojans (21-2) at noon. The winners will meet on May 12 at noon. All three NorCal men's teams in the NCAAs will play on the road on May10. Cal (14-9) will face No. 34 Florida State (18-10) in Gainesville, Fla., Stanford (12-11) will take on No. 20 LSU (15-11) in Malibu, and Sac State (17-12) will go against host USC (23-4). The No. 4 Trojans are four-time defending NCAA champions, but Steve Johnson completed his eligibility last year after winning two straight NCAA singles crowns. The last 16 men's and 16 women's teams will compete for the NCAA titles May 16-21 in Urbana, Ill. The singles and doubles competitions are scheduled for May 22-27 at the same site. Participants in NCAA singles and doubles will be announced Wednesday. --Chau Truong and Julianna Bacelar, first-team doubles at No. 3. --Sabastiani Leon Chao (No. 2) and Bacelar (No. 5), second-team singles. --Chao and Erica Medlin (No. 1) and Boczova and Jessica Willett (No. 2), second-team doubles. --Alex Golding (Pacific), Kyle Miller (UC Davis), Toki Sherbakov (UC Davis) and Denis Stolyarov (Pacific), second-team singles. --Daniel Alameh (Pacific) and Parker Kelley (UC Davis), honorable-mention singles. --Golding and Verbeek (Pacific), first-team doubles. --Adam Levie and Sherbakov (UC Davis), second-team doubles. --Adam Luba and Miller (UC Davis), honorable-mention doubles. --Iveta Masarova (Pacific), first-team singles. --Megan Heneghan (UC Davis) and Hana Ritterova (Pacific), second-team singles. --Layla Sanders (UC Davis), honorable-mention singles. --Masarova and Ritterova (Pacific), second-team doubles. --Nicole Koehly and Sanders (UC Davis), honorable-mention doubles. Mardy Fish, Sacramento Capitals of World TeamTennis (2012-13) -- No. 44 in singles (-2), No. 340 in doubles (+7). Bradley Klahn, 2010 NCAA singles champion and 2011 NCAA doubles runner-up from Stanford -- No. 188 in singles (-3), No. 347 in doubles (+6). Sam Querrey, San Francisco native, Capitals (2012-13) -- No. 19 in singles (no change), No. 108 in doubles (+1). Ryan Sweeting, Capitals (2012-13) -- No. 265 in singles (-34), No. 831 in doubles (+3). Dmitry Tursunov, Folsom resident from Russia -- No. 58 in singles (+8), No. 270 in doubles (+4). Mallory Burdette, NCAA singles runner-up in 2012 and NCAA doubles champion in 2011 and 2012 from Stanford -- Career-high No. 85 in singles (+2), No. 362 in doubles (-1). Raquel Kops-Jones, 2003 NCAA doubles champion from Cal -- No. 14 in doubles (no change), No. 1,127 in singles (+3). Megan Moulton-Levy, Capitals (2013) -- No. 65 in doubles (-1), unranked in singles. Maria Sanchez, Modesto product -- No. 115 in singles (-4), No. 123 in doubles (-7). Taylor Townsend, Capitals (2013) -- No. 349 in singles (+2), No. 531 in doubles (+2). Munich (men), early rounds, Tennis Channel, 6-10 p.m. (delay). Munich (men), early rounds, Tennis Channel, 4 p.m.-midnight (delay). Oeiras (women), semifinals, Tennis Channel, 8 a.m.-noon (delay). Oeiras (men), quarterfinals, Tennis Channel, noon-4 p.m. (delay), 8 p.m.-midnight (repeat). Munich (men), quarterfinals, Tennis Channel, 4-8 p.m. (delay). Oeiras (women), final, Tennis Channel, 9-11 a.m. (delay). Oeiras (men), semifinals, Tennis Channel, 11 a.m.-3 p.m. (delay), 7-9 p.m. (repeat). Munich (men), semifinals, Tennis Channel, 3-7 p.m. (delay). Oeiras (men), final, Tennis Channel, 5-7 a.m. (delay), 1-3 p.m. (repeat), 7-9 p.m. (repeat). Munich (men), final, Tennis Channel, 11 a.m.-1 p.m. (delay), 5-7 p.m. (repeat). Saturday-Sunday -- Rio del Oro Junior Championships, Rio del Oro Racquet Club, 119 Scripps Dr., Sacramento 95825, www.norcal.usta.com. May 10-13 -- $10,000 USTA National Men's, Women's & Mixed 30 Indoor Championships, Spare Time Indoor Tennis Center, 11205 Pyrites Way, Gold River, Calif., 95670, www.usta.com, www.sparetimeinc.com. Sunday couldn't have gone much worse for Stanford's Krista Hardebeck. In the most one-sided final in the history of the Pac-12 Championships, 40th-ranked Kyle McPhillips of UCLA trounced No. 19 Hardebeck 6-1, 6-0 in Ojai, Calif. Both players are freshmen. Hardebeck, from Santa Ana in the Los Angeles area, had defeated McPhillips, from Willoughby, Ohio, 7-5, 6-1 in Stanford's 4-3 victory over UCLA on March 29 in Los Angeles. McPhillips also lost to Cal freshman Klara Fabikova the following day but has won nine consecutive matches since then. McPhillips became the first UCLA player to win the conference singles title since Yasmin Schnack, from the Sacramento suburb of Elk Grove, in 2010 and the first Bruins freshman to do so since Sara Walker in 2000. Hardebeck was trying to become the third straight Stanford player to win the crown, following Kristie Ahn in 2011 and Nicole Gibbs last year. Gibbs, a Stanford junior, competed in the $50,000 Boyd Tinsley Clay Court Classic in Charlottesville, Va., instead of the Pac-12 Championships. She reached the singles quarterfinals, losing to Patricia Mayr-Achleitner of Austria, and the doubles final with fellow American Shelby Rogers, falling to Nicola Slater of Great Britain and CoCo Vandeweghe of the United States. Big Sky Conference Championships in Gold River, Calif. -- The Sacramento State women won their 12th straight title and the Sac State men their fifth in a row. Both teams defeated Montana 4-1 and advanced to the NCAA Tournament, which begins on May 10. The Sac State women (13-13) extended their conference winning streak to 105 matches dating to 2002. The Hornets' Rebeca Delgado, a senior from Mexico, pounded Heather Davidson, a senior from Rocklin in the Sacramento area, 6-2, 6-1 at No. 1 singles. Leading the Sac State men (17-12) was Marek Marksoo, a sophomore from Estonia who drubbed Mikolaj Caruk, a junior from Poland, 6-0, 6-0 at No. 1 singles. Sean Kolar, a sophomore from the Sacramento suburb of Loomis, clinched the title with a 6-4, 6-4 victory over Ethan Vaughn at No. 4 singles. Family affair -- Siblings Michael and Ali Facey of Cameron Park, near Sacramento, played on losing teams in their respective conference finals. Michael, a senior at Montana, trailed 6-5 at No. 1 doubles and led 7-5, 4-5 at No. 3 singles when the matches were halted because Sac State had clinched the doubles point and then the title. His parents, Mike and Kim, watched the matches at the Gold River Racquet Club, about a 25-minute drive down Highway 50 from the family's home. The No. 31 UC Irvine women, with Ali Facey, fell to No. 45 Long Beach State 4-1 in Indian Wells. Facey, a sophomore, lost 8-6 at No. 2 doubles and 6-2, 6-4 at No. 5 singles. Her twin sister, Kat, also is on the Anteaters' roster but did not play against the 49ers. Big West Conference Championships in Indian Wells -- The Pacific men lost to UC Santa Barbara 4-2 in the final. The Tigers, who ended their season at 16-9, received victories from Denis Stolyarov at No. 3 singles and Ben Mirkin at No. 5 singles. The Gauchos (12-13) advanced to the NCAA Tournament. Two freshmen, one from Stanford, will meet today for the women's singles title in the Pacific-12 Conference Championships in Ojai, Calif. The Cardinal's Krista Hardebeck, ranked 19th nationally, upended No. 8 Anett Schutting, a Cal junior, 2-6, 6-4, 6-2 in Saturday's semifinals. Meanwhile, No. 40 Kyle McPhillips of UCLA outlasted No. 29 Kristie Ahn, a Stanford junior, 3-6, 6-1, 6-4. Hardebeck will try to become the third consecutive Stanford player to win the title when she faces McPhillips at 10 a.m. Nicole Gibbs triumphed last year as a sophomore and went on to earn the NCAA singles and doubles crowns. Ahn prevailed in 2011. Gibbs, who will defend her NCAA titles next month, played in a $50,000 tournament in Charlottesville, Va., this week. She lost in the singles quarterfinals but will compete in today's doubles final with fellow American Shelby Rogers. Both Bay Area doubles teams lost in Saturday's semifinals. No. 2 Kaitlyn Christian and Sabrina Santamaria of USC defeated No. 38 Stacey Tan and Ellen Tsay of Stanford 8-4, and No. 58 Courtney Dolehide and Pamela Montez of UCLA beat No. 29 Lynn Chi and Schutting of Cal 8-6. Western Athletic Conference Championships in Denver -- Chau Truong, San Jose State's career leader in combined women's singles and doubles victories, recorded the biggest win of her career. Truong, a 4-foot-10 (1.47-meter) senior from San Francisco, defeated Emma Isberg 4-6, 7-6 (6), 6-2 at No. 3 singles to give No. 66 San Jose State (19-5) a 4-3 victory over No. 52 Denver in the final. Truong, a left-hander, survived championship point in the second-set tiebreaker. "I had the feeling I could be one of the last to play," Truong said on sjsuspartans.com. "The pressure was very positive to me. I loved the pressure." The Spartans avenged a 4-3 loss to Denver (18-4) in the regular season, won the first conference title in their 35-year history and earned an automatic bid to next month's NCAA Tournament. Big Sky Conference Championships in Gold River, Calif. -- The host Sacramento State men and women advanced to their respective finals with 4-0 victories. The Sac State men (16-12) topped Weber State, and the Hornets women (12-13) downed Southern Utah. The Sac State men seek their fifth consecutive Big Sky title, and the women eye their 105th straight conference victory dating to 2002. Both teams will face Montana, featuring senior Michael Facey of Cameron Park in the Sacramento area at No. 3 singles and No. 1 doubles. The men will play at 10 a.m. and the women at 2 p.m.
Big West Conference Championships in Indian Wells -- Ali Facey, Michael's sister, helped the No. 31 UC Irvine women (22-3) breeze to a 4-0 semifinal victory over Hawaii (6-15). Facey defeated Kelsey Daguio 6-4, 6-3 at No. 5 singles and teamed with Brooke Schweyer to beat Rebecca Faltusz and Martina Kostalova 8-2 at No. 2 doubles. The Anteaters will play No. 45 Long Beach State in today's final for the sixth consecutive year. The 49ers (20-3) eliminated UC Santa Barbara 4-1 to reach their 13th straight Big West title match. West Coast Conference Championships in San Diego -- The No. 63 Pepperdine women continued a remarkable turnaround this season with a 4-0 victory over No. 40 Saint Mary's (13-9) in the final. The Waves, who began the season with nine consecutive losses, have won 12 of their last 14. They earned an automatic bid to the NCAA Tournament. At least one woman from a Northern California team will play in the singles final of the Pacific-12 Conference Championships in Ojai, Calif.
And there could be an all-Stanford or all-Bay Area final. Eighth-ranked Anett Schutting, a Cal junior, will meet No. 19 Krista Hardebeck, a Stanford freshman, today in one semifinal. No. 29 Kristie Ahn, a Stanford junior, will face No. 40 Kyle McPhillips, a UCLA freshman, in the other. Both matches are scheduled to begin at 10:30 a.m.
McPhillips led No. 5 Zsofi Susanyi of Cal 6-4, 3-2 in Friday's quarterfinals when the Bears star retired with an undisclosed injury. Stanford junior Nicole Gibbs, the defending singles champion and reigning NCAA singles and doubles champ, is playing in a $50,000 tournament in Charlottesville, Va., this week. She lost in the singles quarterfinals Friday but is scheduled to play in the doubles semifinals with Shelby Rogers today. No. 1 UCLA def. No. 41 Stanford 4-0. No. 1 singles: No. 25 Dennis Novikov (UCLA) vs. No. 46 John Morrissey, abandoned. Team records: UCLA 23-1, Stanford 12-11. No. 5 USC def. No. 18 Cal. No. 1 singles: No. 17 Ray Sarmiento (USC) vs. No. 33 Ben McLachlan, abandoned. Team records: USC 23-3, Cal 14-9. No. 40 Kyle McPhillips (UCLA) def. No. 5 Zsofi Susanyi (Cal) 6-4, 3-2, retired. No. 8 Anett Schutting (Cal) def. No. 62 Klara Fabikova (Cal) 6-2, 6-4. No. 19 Krista Hardebeck (Stanford) def. Sarah Pham (Utah) 0-6, 7-5, 6-1. No. 29 Kristie Ahn (Stanford) def. No. 21 Jacqueline Cako (Arizona State) 6-2, 6-2. No. 2 Kaitlyn Christian and Sabrina Santamaria (USC) def. Kelly Chui and Tayler Davis (Cal) 8-1. No. 38 Stacey Tan and Ellen Tsay (Stanford) def. No. 45 Klara Fabikova and Zsofi Susanyi (Cal), walkover. No. 29 Lynn Chi and Anett Schutting (Cal) def.Giuliana Olmos and Zoe Scandalis (USC) 8-1. No. 10 Pepperdine def. USF 4-0. No. 1 singles: No. 8 Sebastian Fanselow (P) def. Thai Tu 6-1, 6-1. Team records: Pepperdine 23-5, USF 14-8. No. 40 Saint Mary's def. No. 56 San Diego 4-1. No. 1 singles: No. 23 Jenny Jullien (SM) def. No. 79 Laura Claus 6-4, 6-3. Team records: Saint Mary's 13-8, San Diego 12-11. Pacific def. Cal Poly 4-3. No. 1 singles: Andre Dome (CP) def. Sem Verbeek 6-3, 6-3. Team records: Pacific 16-8, Cal Poly 14-9. No. 45 Long Beach State def. UC Davis 4-0. No. 1 singles: Ebba Unden (LBS) def. Megan Heneghan 6-2, 6-3. Team records: Long Beach State 19-3, UC Davis 11-13. UC Irvine def. Pacific 4-0. No. 1 singles: Kristina Smith vs. Iveta Masarova, did not finish. Team records: UC Irvine 21-3, Pacific 4-0. No. 66 San Jose State def. Louisiana Tech 4-2. No. 1 singles: No. 53 Klaudia Boczova (SJS, 2013 WAC Player of the Year) def. Joanna Nalborska 7-5, 6-3. Team records: San Jose State 18-5, Louisiana Tech 15-5. Montana def. Eastern Washington 4-2. No. 1 singles: Joseph Cohen (EW) def. Mikolaj Caruk 6-3, 6-4. Team records: Montana 10-7, Eastern Washington 9-13. Weber State def. Idaho State 4-3. No. 1 singles: Jakub Gewert (WS) def. Christian Marian 6-7, 6-1, 6-3. Team records: Weber State 11-11, Idaho State 13-6. Northern Arizona def. Montana State 4-1. No. 1 singles: Char Hjalmarsson (MSU) def. Hannah Stone 6-1, 6-2. Team records: Northern Arizona 17-9, Montana State 6-12. Southern Utah def. Northern Colorado 4-1. Olya Kunz (SU) def. Jennifer Buchanan 6-2, 6-4. Team records: Southern Utah 12-7, Northern Colorado 12-9. Dmitry Tursunov lost Thursday but still had a good tournament. The 30-year-old Russian, who lives in Moscow and the Sacramento suburb of Folsom, fell to 16th-seeded Thomaz Bellucci of Brazil 4-6, 6-1, 6-3 on clay in the third round of the Barcelona Open. It was their first career meeting. Playing on his worst surface, Tursunov qualified for the tournament, beat 49th-ranked Denis Istomin of Uzbekistan in the first round and ousted top-seeded and fourth-ranked David Ferrer in the second round. By reaching the third round, Tursunov will continue to rise in the world rankings. Tursunov has almost halved his ranking this year, jumping from No. 122 to No. 66 after a series of injuries. He climbed to a career-high No. 20 in 2006. Bellucci advanced to his first ATP World Tour quarterfinal since last October, when he reached the Moscow final before losing to Andreas Seppi of Italy. No. 18 Cal def. No. 74 Utah 5-0. No. 1 singles: No. 33 Ben McLachlan (C) vs. No. 107 Slim Hamza, abandoned. Team records: Cal 14-8, Utah 13-12. No. 41 Stanford def. No. 33 Washington 4-2. No. 1 singles: No. 14 Kyle McMorrow (W) led No. 46 John Morrissey 4-6, 6-4, 5-2 (did not finish). Team records: Stanford 12-10, Washington 17-11. No. 5 Zsofi Susanyi (Cal) def. Andjela Kankaras (Washington State) 6-4, 6-3. No. 8 Anett Schutting (Cal) def. Patricia Skowronski (Oregon) 6-2, 6-2. No. 19 Krista Hardebeck (Stanford) def. Andjela Nemcevic (Washington) 6-1, 6-4. No. 29 Kristie Ahn (Stanford) def. Wende Janssens (Colorado) 6-1, 7-6 (4). No. 62 Klara Fabikova (Cal) def. Leighann Sahagun (Arizona State) 6-1, 6-1. No. 97 Stacey Tan (Stanford) def. Callie Craig (Utah) 6-4, 6-2. (Note: Stanford junior Nicole Gibbs, the defending NCAA singles and doubles champion, is playing in a $50,000 professional tournament in Charlottesville, Va., this week. She has reached the singles quarterfinals and doubles semifinals). No. 5 Zsofi Susanyi (Cal) def. Grace Ysidora (Washington) 6-3, 6-0. No. 8 Anett Schutting (Cal) def. No. 76 Gabriella DeSimone (USC) 4-3, retired. No. 19 Krista Hardebeck (Stanford) def. Desirae Krawczyk (Arizona State) 6-2, 6-2. No. 21 Jacqueline Cako (Arizona State) def. No. 97 Stacey Tan (Stanford) 6-2, 6-4. No. 29 Kristie Ahn (Stanford) def. No. 112 Giuliana Olmos (USC) 6-0, 6-1. No. 62 Klara Fabikova (Cal) def. No. 93 Tereza Bekerova (Utah) 6-2, 2-6, 6-0. USF def. No. 60 Santa Clara 4-2. No. 1 singles: Thai Tu (USF) def. No. 83 John Lamble 7-5, 6-2. Team records: USF 14-7, Santa Clara 17-10. San Diego def. Saint Mary's 4-0. No. 1 singles: Thibaut Visy (SD) vs. No. 114 Jesse Kiuru 1-6, 6-2 (did not finish). Team records: San Diego 17-8, Saint Mary's 10-15. No. 63 Santa Clara def. Loyola Marymount 4-2. No.1 singles: No. 28 Katie Le (SC) def. April Bisharat 6-1, 6-4. Team records: Santa Clara 12-9, Loyola Marymount 11-12. San Diego def. USF 4-3. No. 1 singles: No. 88 Andrea Ka (USF) def. No. 79 Laura Claus 6-1, 6-4. Team records: San Diego 12-10, USF 14-9. Pacific def. UC Davis 4-2. No. 1 singles: Sem Verbeek (P) vs. Toki Sherbakov, abandoned. Team records: Pacific 15-8, UC Davis 8-13. UC Davis def. UC Riverside 4-0. No. 1 singles: Layla Sanders (UCD) vs. Jamie Raney, abandoned. Note: UC Davis' top player, Megan Heneghan, did not play because of a foot injury. Team records: UC Davis 11-12, UC Riverside 1-16. Pacific def. Cal Poly 4-0. No. 1 singles: Iveta Masarova (P) def. Louise Oxnevad 6-4, 6-1. Team records: Pacific 10-12, Cal Poly 4-18. No. 66 San Jose State def. Texas-San Antonio 4-0. No. 1 singles: No. 53 Klaudia Boczova (SJS) def. Jacobea Junger 6-4, 6-1. Team records: San Jose State 17-5, Texas-San Antonio 7-13.
fourth-ranked David Ferrer in the Barcelona Open on Wednesday. Dmitry Tursunov scored one of the biggest victories of his career on Wednesday. The 30-year-old Russian qualifier, who has residences in Moscow and the Sacramento suburb of Folsom, stunned No. 1 seed and four-time runner-up David Ferrer of Spain 7-5, 3-6, 6-1 in the second round of the Barcelona Open. At No. 4 in the world, Ferrer and now-retired Ivan Ljubicic of Croatia are the highest-ranked players Tursunov has beaten since he turned pro in 2000. He knocked off Ljubicic in the the second round at Wimbledon in 2006, when Tursunov attained a career-high ranking of No. 20 and went 4-0 in Davis Cup singles to help his country win the title. Playing in his first clay-court tournament of the year, the 66th-ranked Tursunov defeated a top-10 player for the first time since upending No. 10 Jurgen Melzer in the quarterfinals at Marseille in Febuary 2011. Tursunov, known as the "Tolstoy of tennis" because of his witty blog for the ATP World Tour in 2006, and Ferrer met for the first time. They were supposed to play each other in the second round at Miami last month, but Tursunov defaulted with a stomach illness. Ferrer, 31, was playing on his best surface and Tursunov his worst, although the latter reached the French Open doubles quarterfinals or semifinals from 2007 through 2009 with countryman Igor Kunitsyn. But Ferrer, who received a first-round by in Barcelona, was playing in his first match since falling to Andy Murray in a third-set tiebreaker in the Miami final last month. Ferrer missed last week's Monte Carlo Masters with a thigh injury sustained in Miami. Tursunov, who's 11-33 against top-10 players, took another step in the latest comeback of his injury-plagued career. He had three operations on his left foot or ankle within one year in 2009 and 2010. A right-hander with a two-handed backhand, Tursunov strained a tendon in his left wrist in September 2011 but played through the Australian Open in January last year before sitting out for three months. After plunging to No. 150 in the world last August, Tursunov ended the year at No. 122. He sat out this past January to rest nagging back, left wrist and right shoulder injuries, according to his manager, Michael Gorin. But Tursunov has almost halved his ranking in the last three months, reaching the Marseilles semifinals as a qualifier and the Dubai quarterfinals back to back in February. With his showing in Barcelona, he will approach or return to the top 50. Tursunov is scheduled to face 16th-seeded Thomaz Bellucci, a 25-year-old left-hander from Brazil, in the third round on Thursday at 11 a.m. Barcelona time (2 a.m. PDT). It will be their first career meeting. Bellucci, ranked 44th, advanced with a 6-7 (5), 6-3, 7-5 victory over 21-year-old wild card Pablo Carreno-Busta of Spain. Here's a link to an in-depth story I wrote in 2011 about Tursunov's turbulent past: http://norcaltennisczar.blogspot.com/2011/09/tursunov-no-longer-thinks-father.html. No. 33 Washington def. Arizona 4-0. No. 1 singles: No. 14 Kyle McMorrow (W) def. Kieran Thompson 6-1, 6-1. Washington will play Stanford, which had a first-round bye, in Thursday's quarterfinals. No. 74 Utah def. No. 49 Oregon 4-3. No. 1 singles: Robin Cambier (O) def. No. 107 Slim Hamza 4-6, 6-4, 6-0. Utah will play No. 18 Cal, which had a first-round bye, in Thursday's quarterfinals. No. 60 Santa Clara def. Gonzaga 4-0. No. 1 singles: Alvaro Nazal (G) led No. 83 John Lamble 7-6 (3), 1-0 (did not finish). USF def. Loyola Marymount 4-3. No. 1 singles: Thai Tu (USF) def. Othar Kordsachia 6-2, 2-6, 6-2. Saint Mary's def. Portland 4-1. No. 1 singles: Ratan Gill (P) led No. 114 Jesse Kiuru 6-2, 5-6 (did not finish). USF def. Portland 4-2. No. 1 singles: Andrea Ka (USF) def. Maja Mladenovic 7-5, 6-0. Wimbledon announced the largest prize money increase and total purse in tennis history on Tuesday. Players will receive a 40-percent increase to 22.6 million pounds ($34.5 million) for the June 24-July 7 tournament. Wimbledon also plans to build a retractable roof over Court No. 1 in time for the 2019 championships, but All England Club chairman Philip Brook would not disclose the cost to reporters. Centre Court has had a retractable roof since 2009 that cost a reported 80 million pounds ($121.8 million). The championships often are plagued by rain. Despite Wimbledon's increased costs, Bloomberg News quoted Brook as saying the tournament will not raise ticket prices. A grounds pass for the first week costs 20 pounds ($30.46). The majority of the prize money increase will go to those who need it most -- players who lose early. Those falling in the first three rounds of singles, 88 percent of the draw, will receive 60 percent more than in 2012. That will give them a boost of about 90 percent over the past two years. First-round losers will collect 23,500 pounds ($35,790), a 62 percent raise. Qualifying will feature a 41-percent increase, bringing the raise for those players to 71 percent in the past two years. Top players also will be rewarded. The final 16 in singles will receive an average increase of 40 percent, with the men's and women's champions earning 1.6 million pounds ($2.44 million). That's a 39-percent increase over $1.75 million in 2012. Doubles prize money will jump 22 percent. Adding a retractable roof over Court No. 1 will give Wimbledon the ability to maintain covered play on its two main show courts for more than 26,500 spectators. Last year, Wimbledon officials announced the grass-court tournament will be moved back one week beginning in 2015 to create a three-week gap after the French Open on clay. The change will give players more time to rest and recover from Roland Garros and to prepare for Wimbledon during a longer grass-court season. Meanwhile, the first official Wimbledon iPad app will be launched for this year's tournament to complement wimbledon.com. Users can navigate around the grounds for live content (scores, draws, live video and live radio) and explore 360-degree content. Mardy Fish, Capitals (2012-13) -- No. 42 in singles (no change), No. 347 in doubles (-11). Bradley Klahn, 2010 NCAA singles champion and 2011 NCAA doubles runner-up from Stanford -- No. 185 in singles (-3), No. 353 in doubles (+123). Scott Lipsky, 2002 NCAA doubles runner-up from Stanford -- No. 27 in doubles (+1), unranked in singles. Sam Querrey, San Francisco native, Capitals (2012-13) -- No. 19 in singles (no change), No. 109 in doubles (-3). Ryan Sweeting, Capitals (2012-13) -- No. 231 in singles (-4), No. 834 in doubles (+5). Dmitry Tursunov, Folsom resident from Russia -- No. 66 in singles (no change), No. 274 in doubles (-4). Mallory Burdette, NCAA singles runner-up in 2012 and NCAA doubles champion in 2011 and 2012 from Stanford -- Career-high No. 87 in singles (+1), No. 361 in doubles (-1). Raquel Kops-Jones, 2003 NCAA doubles champion from Cal -- No. 14 in doubles (no change), No. 1,130 in singles (+2). Megan Moulton-Levy, Capitals (2013) -- No. 64 in doubles (no change), unranked in singles. Maria Sanchez, Modesto resident -- No. 111 in singles (+1), No. 116 in doubles (+1). Taylor Townsend, Capitals (2013) -- No. 351 in singles (-3), No. 533 in doubles (no change). Bucharest (men), early rounds, Tennis Channel, 10 a.m.-2 p.m. (delay). Barcelona (men), round of 16, Tennis Channel, 4:30-10:30 a.m. (live). Bucharest (men), round of 16, Tennis Channel, noon-4 p.m. (delay). Barcelona (men), quarterfinals, Tennis Channel, 3:30-11:30 a.m. (live). Stuttgart (women), quarterfinals, Tennis Channel, 11:30 a.m.-7:30 p.m. (delay). Bucharest (men), quarterfinals, Tennis Channel, 7:30-11:30 p.m. (delay). Barcelona (men), semifinals, Tennis Channel, 4:30-9:30 a.m. (live). Stuttgart (women), semifinals, Tennis Channel, 10 a.m.-noon (live), noon-2 p.m. (delay). Bucharest (men), semifinals, Tennis Channel, 2-6 p.m. (delay). Barcelona (men), final, Tennis Channel, 7-9:30 a.m. (live). Stuttgart (women), final, Tennis Channel, 10 a.m.-noon (live). Bucharest (men), final, Tennis Channel, noon-2 p.m. (delay). Wednesday-Sunday -- Pac-12 Men's and Women's Championships, Ojai Valley Athletic Club/Libbey Park, Ojai, www.pac12.com. Wednesday-Sunday -- West Coast Conference Men's and Women's Championships, Barnes Tennis Center, San Diego, www.wccsports.com. Thursday-Sunday -- Big West Conference Men's and Women's Championships, Indian Wells Tennis Garden, www.bigwest.org. Saturday-Sunday, May 4-5 -- Rio del Oro Junior Championships, Rio del Oro Racquet Club, 119 Scripps Dr., Sacramento 95825, www.norcal.usta.com. June 29-July 6 -- $50,000 Gold River Women's Challenger, Gold River, www.usta.com. 2012 champions: Maria Sanchez, Asia Muhammad-Yasmin Schnack. SACRAMENTO -- Marek Marksoo, the top player for the Sacramento State men, returned from a one-month injury layoff to give the Hornets a dramatic 4-3 victory over Saint Mary's on Sunday. But that was only part of the story, as a poignant, inspirational scene unfolded at the far end of the Rio del Oro Racquet Club. Thomas Hunt of Saint Mary's performed amazingly well in a 6-3, 7-5 loss to Tom Miller at No. 6 singles. Hunt, a 6-foot-2 freshman from New Zealand, has a prosthetic left arm. He tossed the ball in the same place with his left arm every time on his serve and held his racket with his artificial hand while picking up balls. He slugged forehands and backhands with his strong right arm and showed good volleying form on occasional forays to the net. Hunt prepares to return serve. Hunt, who dropped to 8-11 at No. 6 singles, was born without half of his left arm. It ends just above where the elbow should be, and his parents fitted him for a prosthetic arm months after his birth. Saint Mary's, located in the San Francisco Bay Area, bolted to a 3-1 lead against Sac State in the regular-season finale for both teams. The victory by Miller, a sophomore from England, pulled the Hornets within 3-2, and Sean Kolar tied it with a 6-3, 3-6, 7-6 (2) win at No. 4 singles. Marksoo, a sophomore from Estonia returning from a sprained ankle, then outlasted Jesse Kiuru, a senior from Finland, 7-6, 4-6, 6-4 to lift Sac State. Marksoo is ranked No. 117 and Kiuru No. 116. Sac State (15-12) will be seeded first in the Big Sky Conference Tournament, scheduled for Friday through Sunday at the Gold River Racquet Club in the Sacramento area. Saint Mary's (9-14) will compete in the West Coast Conference Championships, which begin Wednesday in San Diego. No. 60 Santa Clara def. Portland 5-2 in Santa Clara. No. 1 singles: No. 75 John Lamble (SC) def. Ratan Gill 6-0, 1-6, 7-5. Team records: Santa Clara 16-9 overall, 4-4 West Coast Conference; Portland 10-10, 2-5. No. 71 Pacific def. UC Riverside 4-3 in Riverside. No. 1 singles: Jimmy Roberts (UCR) def. Sem Verbeek 6-4, 6-4. Team records: Pacific 14-8 overall, 4-2 Big West Conference; UC Riverside 3-20, 0-5. UC Irvine def. UC Davis 4-3 in Irvine. No. 1 singles: Ryan Cheung (UCI) def. Toki Sherbakov 6-3, 6-4. Team records: UC Irvine 9-16 overall, 5-1 Big West; UC Davis 8-12, 1-5. No. 70 Oregon def. No. 58 Santa Clara in Santa Clara. No. 1 singles: Nicole Long (O) def. No. 28 Katie Le 6-1, 7-5. Team records: Oregon 13-10, Santa Clara 9-9. Thomas Alexander Hunt is 8-10 at No. 6 singles for a struggling Saint Mary's team. 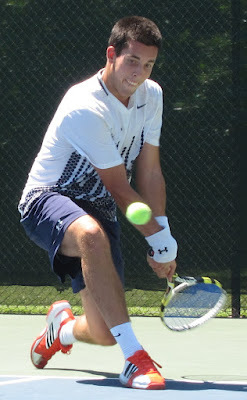 But he might be the most remarkable player in college tennis, especially in Division I. The freshman from New Zealand was born without half of his left arm, the San Francisco Chronicle reported in the featured story of Wednesday's sports section. Hunt is scheduled to play today when Saint Mary's (9-13, 3-5 West Coast Conference) visits Sacramento State (14-12, 9-1 Big Sky Conference) in the regular-season finale for both teams. The dual match is set to begin at 1 p.m. at the Rio del Oro Racquet Club. Hunt's left arm ends just above where the elbow should be. His parents fitted him for a prosthetic arm months after his birth. "Some people don't use a prosthetic arm until they are older, and it takes them a while to get used to it," Hunt told the Chronicle. "I'm glad I got mine early because I became very comfortable with it at a young age." Hunt grew up on a 2,000-acre farm in a tennis-playing family. Thomas Alexander (he goes by Thomas and Alex) learned how to place the ball in his artificial hand and toss it to serve. He also developed a one-handed backhand. Hunt eventually met Lan Bale, a coach and former professional player who had connections with college coaches in the United States, and wound up at Saint Mary's in the San Francisco Bay Area. No. 18 Cal def. No. 42 Stanford 4-3 at Stanford. No. 1 singles: No. 37 Ben McLachlan (C) def. No. 42 John Morrissey (S) 6-2, 6-4. Team records: Cal 13-8 overall, 5-1 Pacific-12 Conference; Stanford 11-10, 3-4. UC Irvine def. No. 71 Pacific 4-2 in Irvine. No. 1 singles: Ryan Cheung (UCI) def. Alex Golding 6-2, 6-2. Team records: UC Irvine 8-16, 4-1 Big West Conference; Pacific 13-8, 3-2. UC Davis def. UC Riverside 7-0 in Riverside. No. 1 singles: Toki Sherbakov (UCD) def. Jimmy Roberts 6-2, 7-6. Team records: UC Davis 8-11, 1-4 Big West Conference; UC Riverside 3-18, 0-5. USF def. Gonzaga 4-3 in San Francisco. No. 1 singles: Alvaro Nazal (G) def. Thai Tu 6-0, 6-2. Team records: USF 12-7 overall, 4-4 West Coast Conference; Gonzaga 7-14, 0-8. No. 9 Cal def. No. 12 Stanford 4-3 in Berkeley. No. 1 singles: No. 20 Nicole Gibbs (S) def. No. 7 Anett Schutting 6-2, 6-2. Team records: Cal 15-5 overall, 9-1 Pacific-12 Conference; Stanford 16-4, 8-2. No. 58 Santa Clara def. Portland 4-3 in Portland, Ore. No. 1 singles: No. 28 Katie Le (SC) def. Maja Mladenovic 6-3, 6-4. Team records: Santa Clara 12-8 overall, 7-1 West Coast Conference; Portland 8-13, 1-7. UC Davis def. Sonoma State 6-1 in Davis. No. 1 singles: Sara Celma (SS) def. Layla Sanders 6-4, 3-2, retired. Note: The Aggies played without their top singles player, Megan Heneghan, who has been plagued by a right foot injury for several weeks. Team records: UC Davis 10-12, Sonoma State 15-10. USF def. Gonzaga 6-1 in Spokane, Wash. No. 1 singles: Andrea Ka (USF) def. Katie Edwards 6-4, 4-6, 7-5. Team records: USF 13-8 overall, 4-4 West Coast Conference; Gonzaga 9-12, 0-8. The UC Davis men seemed to be on their way to an easy victory. Instead, the Aggies were pushed to the limit. Loyola Marymount stormed back from an 0-3 deficit, but Kyle Miller edged Sebastian Bustamante 6-1, 3-6, 7-6 (6) at No. 2 singles to give UC Davis a 4-3 nonconference victory Friday in Los Angeles. Todd Volmari of Loyola Marymount (4-18) had defeated Toki Sherbakov 6-4, 4-6, 6-1 to tie the score 3-3. But Miller, a junior from Pacific Grove in the Monterey area, pulled through to end a five-match losing streak by UC Davis (7-11). No. 60 Santa Clara def. Gonzaga 4-3 in Santa Clara. No. 1 singles: Alvaro Nazal (G) def. No. 75 John Lamble 6-4, 6-3. Team records: Santa Clara 15-9 overall, 3-4 West Coast Conference; Gonzaga 7-13, 0-7. San Diego def. Saint Mary's 6-1 in San Diego. No. 1 singles: Thibaut Visy (SD) def. No. 116 Jesse Kiuru 6-1, 6-3. Team records: San Diego 16-8 overall, 6-2 West Coast Conference; Saint Mary's 9-13, 2-5. USF def. Portland 6-1 in San Francisco. No. 1 singles: Ratan Gill (P) def. Thai Tu 6-4, 4-6, 1-0 (10-7). Team records: USF 12-8 overall, 3-4 West Coast Conference; Portland 8-12, 1-6. No. 58 Santa Clara def. Gonzaga 6-1 in Santa Clara. No. 1 singles: No. 28 Katie Le (SC) def. Katie Edwards 6-2, 6-0. Team records: Santa Clara 10-8 overall, 6-1 West Coast Conference; Gonzaga 9-11, 0-6. USF def. Portland 4-3 in Portland, Ore. No. 1 singles: No. 80 Andrea Ka (USF) def. Maja Mladenovic 4-6, 6-4, 6-0. Team records: USF 12-8 overall, 3-4 West Coast Conference; Portland 8-12, 1-6. Mardy Fish, Capitals (2012-13) -- No. 42 in singles (no change), No. 336 in doubles (+5). Bradley Klahn, 2010 NCAA singles champion and 2011 NCAA doubles runner-up from Stanford -- Career-high No. 182 in singles (+7), No. 476 in doubles (no change). Scott Lipsky, 2002 NCAA doubles runner-up from Stanford -- No. 28 in doubles (-1), unranked in singles. Sam Querrey, San Francisco native, Capitals (2012-13) -- No. 19 in singles (+1), No. 106 in doubles (-23). Ryan Sweeting, Capitals (2012-13) -- No. 227 in singles (-30), No. 839 in doubles (+6). Dmitry Tursunov, Folsom resident from Russia -- No. 66 in singles (+2), No. 270 in doubles (+2). Pedro Zerbini, All-Pacific-10 Conference first team at Cal (2009-11) -- No. 469 in singles (+5), No. 423 in doubles (-1). Mallory Burdette, NCAA singles runner-up in 2012 and NCAA doubles champion in 2011 and 2012 from Stanford -- Career-high No. 88 in singles (+1), No. 360 in doubles (+1). Raquel Kops-Jones, 2003 NCAA doubles champion from Cal -- No. 14 in doubles (no change), No. 1,132 in singles (+10). Megan Moulton-Levy, Capitals (2013) -- No. 64 in doubles (-1), unranked in singles. Maria Sanchez, Modesto resident -- No. 112 in singles (no change), No. 117 in doubles (-1). Romana Tedjakusuma, Tracy resident from Indonesia -- No. 458 in singles (+4), No. 1,091 in doubles (-2). Taylor Townsend, Capitals (2013) -- Career-high No. 348 in singles (+2), No. 533 in doubles (no change). Monte Carlo (men), early rounds, Tennis Channel, 1:30-9:30 a.m. (live). Monte Carlo (men), round of 16, Tennis Channel, 1:30-9:30 a.m. (live). Monte Carlo (men), quarterfinals, Tennis Channel, 1:30-9:30 a.m. (live). Monte Carlo (men), semifinals, Tennis Channel, 4-9 a.m. (live). Fed Cup, World Group playoffs, Sweden at United States, Tennis Channel, 11 a.m.-3 p.m. (live). Fed Cup, World Group semifinals, Czech Republic at Italy, 3-7 p.m. (delay). Monte Carlo (men), final, Tennis Channel, 5-7:30 a.m. (live), 7:30-10 a.m. (repeat). Fed Cup, World Group playoffs, Sweden at United States, Tennis Channel, 10 a.m.-4 p.m. (live). Fed Cup, World Group semifinals, Czech Republic at Italy, Tennis Channel, 4-10 p.m. (delay). No. 42 Stanford def. Pacific 7-0 at Stanford. No. 1 singles: No. 42 John Morrissey (S) def. Alex Golding 6-1, 0-6, 6-3. Team records: Stanford 11-9 overall, 3-3 Pacific-12 Conference; Pacific 13-7 overall, 3-1 Big West Conference. Saturday-Sunday -- Fed Cup, World Group playoffs, United States vs. Sweden in Delray Beach, Fla., www.fedcup.com. April 27-28, May 4-5 -- Rio del Oro Junior Championships, Rio del Oro Racquet Club, 119 Scripps Dr., Sacramento 95825, www.norcal.usta.com. in the girls 16 final at the Easter Bowl in Rancho Mirage. Eighth-seeded CiCi Bellis of Atherton defeated seventh-seeded Caroline Dolehide of Hinsdale, Ill., 6-4, 6-1 Sunday to win the girls 16 singles title at the prestigious Easter Bowl in Rancho Mirage. Bellis, who turned 14 last Monday, had ousted top-seeded Francesca Dilorenzo of New Albany, Ohio, 7-5, 6-2 in the quarterfinals and fourth-seeded Emma Higuchi of Los Angeles 6-2, 7-5 in the semifinals. Higuchi beat Bellis in last year's girls 14 final. Here's a link to a profile of Bellis that I wrote last June: http://norcaltennisczar.blogspot.com/2012/06/tiny-bellis-nets-big-results.html. Boys 18 singles quarterfinals -- Martin Redlicki (5), Boca Raton, Fla., def. Mackenzie McDonald (2), Piedmont, 6-2, 3-6, 6-2. Boys 18 doubles final -- Jordi Arconada, Puerto Rico, and Spencer Papa (2), Boca Raton, Fla., def. J.C. Aragone, Yorba Linda, and McDonald (4), 6-1, 7-5. Girls 18 singles quarterfinals -- Mayo Hibi (13), Irvine, def. Michaela Gordon, Los Altos Hills, 6-2, 6-0. Boys 14 doubles semifinals -- Jake Van Emburgh, Verona, Wis., and J.J. Wolf (6), Cincinnati, def. Connor Hance, Torrance, and Sam Riffice (14), Roseville, 7-6 (1), 6-4. Boys 12 singles quarterfinals -- Jaycer Calleros (6), San Antonio, def. Jenson Brooksby (2), Sacramento, 7-5, 6-1. No. 42 Saint Mary's def. No. 71 Loyola Marymount 4-3 in Moraga. No. 1 singles: No. 20 Jenny Jullien (SM) def. April Bisharat 6-1, 6-1. Team records: Saint Mary's 12-8 overall, 7-1 West Coast Conference; Loyola Marymount 10-9, 2-4. No. 69 Pacific def. UC Santa Barbara 4-3 in Stockton. No. 1 singles: Iveta Masarova (P) def. April Scatliffe 6-7, 6-2, 6-2. Team records: Pacific 9-12 overall, 4-5 Big West Conference; UC Santa Barbara 14-7, 5-3. Sacramento State def. Portland State 7-0 in Vancouver, Wash. No. 1 singles: Rebeca Delgado (SS) def. Mandy Mallen 6-0, 6-0. Team records: Sac State 11-13 overall, 10-0 Big Sky Conference; Portland State 11-12, 2-7. No. 66 Pacific def. UC Santa Barbara 4-1 in Stockton. No. 1 singles: Sem Verbeek (P) def. Mbonisi Ndimande 1-6, 6-4, 2-0, retired. Team records: Pacific 13-6 overall, 3-1 Big West; UC Santa Barbara 9-11, 2-2. No. 16 Cal def. Arizona 7-0 in Berkeley. No. 1 singles: No. 35 Ben McLachlan (C) def. Kieren Thompson 7-5, 5-7, 1-0 (10-6). Team records: Cal 12-8 overall, 4-1 Pacific-12 Conference; Arizona 10-12, 0-6. No. 41 Stanford def. Utah 5-2 at Stanford. No. 1 singles: No. 39 John Morrissey (S) def. Dmytro Mamedov 6-1, 6-3. Team records: Stanford 10-9 overall, 3-3 Pac-12; Utah 11-11, 1-5. No. 64 Santa Clara def. USF 4-3 in Santa Clara. No. 1 singles: No. 82 John Lamble (SC) def. Thai Tu 6-3, 6-2. Team records: Santa Clara 14-9 overall, 2-4 West Coast Conference; USF 10-7-1, 2-4. Cal Poly def. No. 66 Pacific 5-2 in Stockton. No. 1 singles: No. 25 Andre Dome (CP) def. Sem Verbeek 6-2, 6-0. Team records: Cal Poly 11-8 overall, 3-1 Big West Conference; Pacific 12-6, 2-1. UC Santa Barbara def. UC Davis 4-3 in Davis. No. 1 singles: Mbonisi Ndimande (UCSB) def. Toki Sherbakov 6-4, 7-5. Team records: UC Santa Barbara 9-10 overall, 2-1 Big West; UC Davis 6-11, 0-4. Loyola Marymount def. Saint Mary's 5-2 in Los Angeles. No. 1 singles: Othar Kordsachia (LM) def. Tuomas Manner 6-2, 6-4. Team records: Loyola Marymount 4-17 overall, 2-5 West Coast Conference; Saint Mary's 9-12, 3-4. No. 11 Cal def. No. 75 Arizona 6-1 in Tucson, Ariz. No. 1 singles: No. 10 Anett Schutting (C) def. No. 74 Lacey Smyth 6-1, 7-6 (4). Team records: Cal 14-5 overall, 8-1 Pac-12; Arizona 9-13, 1-8. No. 13 Stanford def. No. 21 Arizona State 6-1 in Tempe, Ariz. No. 1 singles: No. 27 Nicole Gibbs (S) def. No. 16 Jacqueline Cako 6-4, 7-5. Team records: Stanford 16-3 overall, 8-1 Pac-12; Arizona State 15-5, 5-4. No. 45 Washington def. Sacramento State 5-2 in Seattle. No. 1 singles: Rebeca Delgado (SS) def. Andjela Nemcevic 6-4, 7-5. Team records: Washington 12-9, Sac State 10-13. No. 66 San Jose State def. Idaho 4-0 in Moscow, Idaho. No. 1 singles: No. 47 Klaudia Boczona (SJS) def. Victoria Lozano 6-2, 6-1. Team records: San Jose State 16-5 overall, 8-2 Western Athletic Conference; Idaho 10-11, 3-4. UC Santa Barbara def. UC Davis 5-2 in Davis. No. 1 singles: April Scatliffe (UCSB) def. Layla Sanders 7-5, 2-6, 7-6 (5). Note: The Aggies' regular No. 1 singles player, Megan Heneghan, played doubles only because of a lingering foot injury. Team records: UC Santa Barbara 14-6 overall, 5-2 Big West; UC Davis 9-12, 4-5. Sacramento State history to earn a national singles ranking. Being ranked No. 120 might not sound like much. But it's a big deal at Sacramento State. Marek Marksoo this week became the fourth man in school history to earn a national singles ranking. The Intercollegiate Tennis Association ranks the top 125 singles players from the 273 NCAA Division I tennis programs. Marksoo, a sophomore from Estonia, joined former Hornets Kiryl Harbatsiuk of Belarus (2008-11), Jason Smith of Davis (2009-11) and Anton Stryhas of Belarus (2007-10), according to Sac State. Marksoo is 14-3 in singles with an 11-match winning streak. However, he has missed the last seven matches with a sprained ankle. He began the season as Sac State's No. 2 singles player but replaced senior Aliaksandr Malko of Belarus at No. 1 three matches into the season. Marksoo has gone 13-2 since then. Earlier this year, Marksoo and Malko were ranked 80th in doubles. They also were the fourth doubles team in school history to receive a national ranking, joining Harbatsiuk-Stryhas, Harbatsiuk-Marko Starcevic and Starcevic-Holden Ching. In February, Marksoo became the first Hornet to play in the Davis Cup as Estonia lost to host Ireland 3-2 in the first round of the Europe-Africa zone. Marksoo, 19, lost to Sam Barry 6-2, 6-1, 6-3 in singles and paired with Vladimir Ivanov in a 6-4, 6-3, 3-6, 3-6, 9-7 loss to Barry and James McGee. Sac State (14-12, 9-1 Big Sky Conference) is off until April 21, when the Hornets end their regular season against Saint Mary’s at the Rio del Oro Racquet Club in Sacramento. The dual match is scheduled to begin at 1 p.m.
Sac State will host the Big Sky Conference Tournament on April 26-28 at the Gold River Racquet Club in the Sacramento area. The Hornets have clinched at least the No. 2 seed and will receive a bye in the quarterfinals. No. 7 Pepperdine def. Saint Mary's 7-0 in Pacific Palisades. No. 1 singles: No. 16 Sebastian Fanselow (P) def. No. 100 Jesse Kiuru 6-2, 6-1. Team records: Pepperdine 20-4 overall, 6-0 West Coast Conference; Saint Mary's 9-11, 3-3. No. 16 Cal def. No. 73 Utah 6-1 in Berkeley. No. 1 singles: No. 35 Ben McLachlan (C) def. Dmytro Mamedov 6-2, 6-3. Team records: Cal 11-8 overall, 2-1 Pacific-12 Conference; Utah 11-10, 1-4. No. 41 Stanford def. Arizona 6-1 at Stanford. No. 1 singles: No. 39 John Morrissey (S) def. Kieren Thompson 6-4, 6-1. Team records: Stanford 9-9 overall, 2-3 Pac-12; Arizona 10-11, 0-5. Cal Poly def. UC Davis 5-2 in Davis. No. 1 singles: Andre Dome (CP) def. Toki Sherbakov 6-1, 6-3. Team records: Cal Poly 10-8 overall, 2-1 Big West Conference; UC Davis 6-10, 0-3. No. 11 Cal def. No. 21 Arizona State 6-1 in Tempe, Ariz. No. 1 singles: No. 10 Anett Schutting (C) def. Jacqueline Cako 6-2, 6-1. Team records: Cal 13-5 overall, 7-1 Pac-12; Arizona State 15-4, 5-3. No. 13 Stanford def. No. 75 Arizona 7-0 in Tucson, Ariz. No. 1 singles: No. 27 Nicole Gibbs (S) def. Lacey Smyth 6-3, 6-1. Team records: Stanford 15-3 overall, 7-1 Pac-12; Arizona 9-12, 1-6. No. 66 San Jose State def. Texas-San Antonio 4-1 in Moscow, Idaho. No. 1 singles: Klaudia Boczova (SJS) def. Jacobea Junger 6-2, 6-0. Team records: San Jose State 15-5 overall, 7-1 Western Athletic Conference; Texas-San Antonio 6-12, 1-6. UC Davis def. Pacific 5-2 in Davis. No. 1 singles: Iveta Masarova (P) def. Megan Heneghan 6-1, 6-0. Team records: UC Davis 9-11 overall, 4-4 Big West; Pacific 8-12, 3-5. Bob Bryan recorded his 800th career doubles victory after he and Mike Bryan won two matches Thursday to reach the semifinals of the U.S. Clay Court Championships in Houston, according to atpworldtour.com. Bob Bryan became the third man to win 800 matches, joining Daniel Nestor (885) and Mike Bryan (814). The Bryans, former NCAA champions from Stanford, have 799 victories together. The identical twins and sons of Sacramento Capitals coach Wayne Bryan will turn 35 on April 29. The Bryans have won the Houston title four times (2007, 2009-11). James Blake and Sam Querrey won it last year. Querrey, a San Francisco native and part-time member of the Capitals in World TeamTennnis, withdrew from the Houston tournament with a strained right chest muscle. The top-ranked American at No. 20 in the world said he'll take the next three weeks off. victory over No. 41 Stanford on Wednesday. No. 7 Pepperdine def. No. 41 Stanford 4-3 at Stanford. No. 1 singles: No. 16 Sebastian Fanselow (P) def. No. 39 John Morrissey 6-4, 6-4. Note: Alex Sarkissian gave the Waves an insurmountable 4-2 lead with a 6-3, 6-4 victory over Robert Stineman at No. 3 singles. Team records: Pepperdine 19-4 overall, 5-0 West Coast Conference; Stanford 8-9 overall, 1-3 Pacific-12 Conference. USF def. Saint Mary's 4-3 in Moraga. No. 1 singles: Bernardo Saraiva (USF) def. No. 100 Jesse Kiuru 7-6, 6-2. Note: The dual match came down to No. 3 singles, in which the Dons' Nils Skajaa, a freshman from Denmark, outlasted Tuomas Manner 4-6, 6-2, 6-4. Team records: USF 10-6-1 overall, 2-3 West Coast Conference; Saint Mary's 9-10, 3-2. Nick Andrews, Cal All-American in 2012, resident of Folsom in the Sacramento area -- No. 1,050 in doubles (-5), No. 1,495 in singles (+1). Mardy Fish, Capitals (2012-13) -- No. 42 in singles (no change), No. 341 in doubles (+3). Bradley Klahn, 2010 NCAA singles champion and 2011 NCAA doubles runner-up from Stanford -- No. 189 in singles (-1), No. 476 in doubles (+1). Sam Querrey, San Francisco native, Capitals (2012-13) -- No. 20 in singles (no change), No. 83 in doubles (no change). Ryan Sweeting, Capitals (2012-13) -- No. 197 in singles (-12), No. 845 in doubles (-4). Dmitry Tursunov, Folsom resident from Russia -- No. 68 in singles (-1), No. 272 in doubles (no change). Pedro Zerbini, All-Pacific-10 Conference first team at Cal (2009-11) -- No. 474 in singles (+2), No. 422 in doubles (-2). Mallory Burdette, NCAA singles runner-up in 2012 and NCAA doubles champion in 2011 and 2012 from Stanford -- Career-high No. 89 in singles (+10), No. 361 in doubles (no change). Raquel Kops-Jones, 2003 NCAA doubles champion from Cal -- No. 14 in doubles (no change), No. 1,142 in singles (+3). Megan Moulton-Levy, Capitals (2013) -- Career-high No. 63 in doubles (+6), unranked in singles. Maria Sanchez, Modesto resident -- No. 112 in singles (no change), No. 116 in doubles (+5). Romana Tedjakusuma, Tracy resident from Indonesia -- No. 462 in singles (-2), No. 1,089 in doubles (+3). Taylor Townsend, Capitals (2013) -- No. 350 in singles (-1), No. 533 in doubles (-4). No. 13 Stanford def. Hawaii 7-0 at Stanford. No. 1 singles: No. 35 Kristie Ahn def. Xenia Suworowa 6-1, 6-1. Team records: Stanford 14-3 overall, 6-1 Pacific-12 Conference; Hawaii 4-13 overall, 3-3 Big West Conference. Casablanca (men), early rounds, Tennis Channel, 9-11 a.m. (delay), 6-10 p.m. (delay). Casablanca (men), early rounds, Tennis Channel, 9-11 a.m. (delay), round of 16, 4-10 p.m. (delay). Houston (men), quarterfinals, Tennis Channel, 4-8 p.m. (live). Casablanca (men), quarterfinals, Tennis Channel, 8-10 p.m. (delay). Houston (men), singles semifinals, Tennis Channel, 11 a.m.-1 p.m. and 1:30-3:30 p.m. (live), doubles final, 4-5:30 p.m. (live). Casablanca (men), semifinals, Tennis Channel, 5:30-9:30 p.m. (delay). Houston (men), final, Tennis Channel, noon-2 p.m. (live). Casablanca (men), final, Tennis Channel, 2-4 p.m. (delay). April 20-21 -- Fed Cup, World Group playoffs, United States vs. Sweden in Delray Beach, Fla., www.fedcup.com. There was plenty of drama in addition to wind Monday at UC Davis. Trailing 3-2, Hawaii rallied to defeat the Aggies 4-3 in a nonconference women's match marred by gusts of up to 30 mph (48 kph). Katarina Poljakova overwhelmed Lauren Curry 6-0, 6-2 at No. 2 singles to tie the match 3-3, and Martina Kostalova won it with a 6-2, 5-7, 6-2 decision over Melissa Kobayakawa at No. 3 singles. Earlier, Xenia Suworowa of Hawaii routed Layla Sanders 6-1, 6-1 at No. 1 singles to even the match 2-2. UC Davis' top singles player, Megan Heneghan, played doubles only for undisclosed reasons. Heneghan, a junior from Tustin in the Los Angeles area, was named to the All-Big West Conference singles first team as a freshman and sophomore. Hawaii improved to 4-12 overall and 3-4 in the Big West. UC Davis fell to 8-11 and 3-4. No. 42 San Diego def. No. 56 Santa Clara 6-1 on Sunday in San Diego. No. 1 singles: Thibaut Visy (SD) def. No. 63 John Lamble 6-4, 6-4. Team records: San Diego 14-7 overall, 4-1 West Coast Conference; Santa Clara 13-9, 1-4.
victory over the United States in the Davis Cup quarterfinals. Hope soon turned to despair for the U.S. Davis Cup team. Top-ranked Novak Djokovic of Serbia twisted his right ankle early in the first set of Sunday's opening singles match against No. 20 Sam Querrey in Boise, Idaho. A U.S. victory would have sent the quarterfinal series to a deciding fifth match between American John Isner and Viktor Troicki. But Djokovic had his ankle taped, took anti-inflammatories and proceeded to beat Querrey 7-5, 6-7 (4), 6-1, 6-0 and give Serbia an insurmountable 3-1 lead. Both teams agreed to skip the fifth match. "I sincerely hope that I didn't make it worse, and I'm going to have a few days off," Djokovic told the crowd after the match. "I was able to play some good shots at the right time. "If I wasn't playing for Serbia, if I didn't have my teammates' support, I don't know if I would've played. The first half hour, it was very painful." Querrey, meanwhile, played with a sore chest muscle. "It hurt on my serve," said Querrey, a 6-foot-6 (1.98-meter) San Francisco native and part-time member of the Sacramento Capitals in World TeamTennis. "I wasn't able to get my usual pop, and that's tough when you're playing against the best returner in the world." Serbia, the 2010 Davis Cup champion, will host Canada in the semifinals in September. Canada, led by 15th-ranked Milos Raonic, defeated Italy 3-1 in Vancouver, British Columbia, to reach the semis for the first time. The defending champion Czech Republic will host Argentina in the other semifinal. The United States, which has won a record 32 Davis Cup titles but none since 2007, will try again next year. No. 67 Idaho def. Sacramento State 4-3 in Lewiston, Idaho. No. 1 singles: Dmitry Perevoshchiko (I) def. Roy Brandys 6-2, 6-2. Team records: Idaho 20-4, Sac State 14-12. Saint Mary's def. Hawaii 4-3 in Moraga. No. 1 singles: Jesse Kiuru (SM) def. Jared Spiker 6-1, 6-1. Team records: Saint Mary's 9-9, Hawaii 6-11. Santa Clara def. Saint Mary's 4-3 in Santa Clara. No. 1 singles: No. 28 Katie Le (SC) def. No. 18 Jenny Jullien 7-5, 7-6. Team records: Santa Clara 9-8 overall, 5-1 West Coast Conference; Saint Mary's 10-8, 5-1. The United States is in big trouble now. The top-ranked team of Bob and Mike Bryan lost a heartbreaker to Ilija Bozoljac and Nenad Zimonjic of Serbia 7-6 (5), 7-6 (1), 5-7, 4-6, 15-13 Saturday in Boise, Idaho, in the Davis Cup quarterfinals. Bozoljac and Zimonjic won in 4 hours, 23 minutes to give Serbia a 2-1 lead in the best-of-five competition. Top-ranked Novak Djokovic can eliminate the United States by beating Sam Querrey, a San Francisco native and part-time member of the Sacramento Capitals in World TeamTennis, in today's first singles match (11 a.m. PDT, Tennis Channel). Djokovic is 5-1 lifetime against Querrey, ranked 20th. In the last match, No. 23 John Isner of the United States is scheduled to play No. 44 Viktor Troicki. Zimonjic, 36, reached No. 1 in the world in men's doubles in 2008. He won Wimbledon in 2008 and 2009 and the French Open in 2010, all with Daniel Nestor of Canada. Bozoljac, a 27-year-old journeyman, advanced to the singles final in the 2009 Tiburon Challenger and 2011 Aptos Challenger. "We have to tip our hats to those guys," Bob Bryan told reporters. "Obviously, I thought they played well all day, 36 aces, and they didn't give us much opportunity, especially in the fifth. We're obviously disappointed that we let the team down." The 34-year-old Bryan twins, former NCAA doubles champions from Stanford, fell to 20-4 in Davis Cup doubles with their second straight five-set loss in the prestigious international team competition. It's the first time the Bryans, who won their record 13th Grand Slam men's doubles title at the Australian Open in January, have lost two consecutive Davis Cup doubles matches. They were upset by Marcelo Melo and Bruno Soares of Brazil in the first round of the Davis Cup in Jacksonville, Fla., in February. Djokovic, Troicki and Zimonjic played on Serbia's 2010 Davis Cup championship team. The Bryans helped the United States win the 2007 title. No. 21 Cal def. No. 30 Washington 5-2 in Seattle. No. 1 singles: No. 21 Kyle McMorrow (W) def. No. 44 Ben McLachlan 3-6, 6-3, 6-4. Team records: Cal 10-8 overall, 2-1 Pacific-12 Conference; Washington 15-8, 2-2. No. 44 Oregon def. No. 47 Stanford 4-3 in Eugene, Ore. No. 1 singles: No. 54 John Morrissey (S) def. Robin Cambier 6-3, 6-4. Team records: Oregon 15-4 overall, 2-2 Pac-12; Stanford 8-8, 1-3. No. 43 San Diego State def. No. 56 Santa Clara 7-0 in San Diego. No. 1 singles: Thorsten Bertsch (SDS) def. No. 63 John Lamble 6-3, 6-2. Team records: San Diego State 14-7, Santa Clara 13-8. Sacramento State def. Eastern Washington 5-2 in Spokane, Wash. No. 1 singles: Joseph Cohen (EW) def. Roy Brandys 6-4, 7-6 (6). Team records: Sac State 14-11 overall, 9-1 Big Sky Conference; Eastern Washington 8-11, 4-4. Hawaii def. UC Davis 5-2 in Davis. No. 1 singles: Toki Sherbakov (UCD) def. Jared Spiker 7-5, 7-5. Team records: Hawaii 6-12 overall, 3-1 Big West Conference; UC Davis 6-9, 0-2. No. 12 Stanford def. Oregon 7-0 at Stanford. No. 1 singles: No. 30 Kristie Ahn (S) def. No. 102 Nicole Long 6-2, 6-2. Team records: Stanford 13-3 overall, 6-1 Pac-12; Oregon 12-8, 1-7. No. 43 Long Beach State def. Pacific 5-2 in Stockton. No. 1 singles: Iveta Masarova (P) def. Ebba Unden 6-4, 6-4. Team records: Long Beach State 17-3 overall, 7-1 Big West Conference; Pacific 8-11, 3-4. No. 61 Denver def. No. 66 San Jose State 4-3 in Logan, Utah. No. 1 singles: Klaudia Boczova (SJS) def. Sophia Bergner 6-2, 6-4. Team records: Denver 12-3 overall, 5-0 Western Athletic Conference; San Jose State 14-5, 6-1. Santa Clara def. No. 53 San Diego 6-1 in Santa Clara. No. 1 singles:No. 28 Katie Le (SC) def. No. 107 Laura Claus 6-3, 6-1. Team records: Santa Clara 8-8 overall, 4-1 West Coast Conference; San Diego 8-9, 3-2. Sacramento State def. Hawaii 4-3 in Sacramento. No. 1 singles: Rebeca Delgado (SS) def. Xenia Suworowa 6-4, 6-1. Team records: Sac State 10-12, Hawaii 3-8. UC Davis def. UC Riverside 6-1 in Davis. No. 1 singles: Layla Sanders (UCD) def. Jamie Raney 6-1, 6-1. Team records: UC Davis 8-10 overall, 3-3 Big West; UC Riverside 1-12, 0-6. Mallory Burdette climbed five places to No. 99 in the world. After less than one year as pros, former Stanford stars Mallory Burdette and Bradley Klahn cracked the top 100 and 200 in the world, respectively, for the first time this week. Burdette, a 5-foot-10 (1.77-meter) right-hander from Jackson, Ga., climbed five places to No. 99 after gaining the main draw at Key Biscayne, Fla., as a qualifier and losing in the first round. In her previous tournament, she reached the third round at Indian Wells as a qualifier. Klahn, a 6-foot (1.83-meter) left-hander from the San Diego suburb of Poway, jumped 38 spots to No. 188 after winning one $15,000 tournament in the Los Angeles area and advancing to the final of another. Burdette was ranked No. 409 last July, and Klahn was No. 695 in late June.They have been pros for seven and nine months, respectively. Burdette won the 2011 and 2012 NCAA doubles titles with Hilary Barte and Nicole Gibbs, repectively, and fell in last year's NCAA singles final to Gibbs. After reaching the third round of singles in the U.S. Open in late August, Burdette decided to forgo her senior year at Stanford and turn pro. Klahn stayed at Stanford for four years. He won the 2010 NCAA singles crown as a sophomore but underwent surgery for a herniated disc in October of his junior year. He returned in February 2011 and gained the NCAA doubles final with Ryan Thacher that May. Nick Andrews, Cal All-American in 2012, resident of Folsom in the Sacramento area -- Career-high No. 1,045 in doubles (+3), No. 1,496 in singles (+5). Mardy Fish, Capitals (2012-13) -- No. 42 in singles (-9), No. 344 in doubles (-3). Bradley Klahn, 2010 NCAA singles champion and 2011 NCAA doubles runner-up from Stanford -- Career-high No. 188 in singles (+38), No. 477 in doubles (+3). Ryan Sweeting, Capitals (2012-13) -- No. 185 in singles (-4), No. 841 in doubles (+2). Dmitry Tursunov, Folsom resident from Russia -- No. 67 in singles (+4), No. 272 in doubles (+6). Pedro Zerbini, All-Pacific-10 Conference first team at Cal (2009-11) -- No. 476 in singles (-12), No. 420 in doubles (-2). Mallory Burdette, NCAA singles runner-up in 2012 and NCAA doubles champion in 2011 and 2012 from Stanford -- Career-high No. 99 in singles (+5), No. 361 in doubles (+2). Raquel Kops-Jones, 2003 NCAA doubles champion from Cal -- No. 14 in doubles (no change), No. 1,145 in singles (+3). Megan Moulton-Levy, Capitals (2013) -- Career-high No. 69 in doubles (+3), unranked in singles. Maria Sanchez, Modesto resident -- No. 112 in singles (-3), No. 121 in doubles (no change). Romana Tedjakusuma, Tracy resident from Indonesia -- No. 460 in singles (+3), No. 1,092 in doubles (+6). Taylor Townsend, Capitals (2013) -- Career-high No. 349 in singles (-1), No. 529 in doubles (+12). Charleston (women), early rounds, ESPN2, 10-11:30 a.m. (live). Charleston (women), quarterfinals, ESPN2, 10-11:30 a.m. (live). Davis Cup, Serbia at United States, two singles matches, Tennis Channel, 12:30-6:30 p.m. (live). Monterrey (women), quarterfinals, Tennis Channel, 8 p.m.-midnight (delay). Charleston (women), semifinals, ESPN2, 10 a.m.-noon (live). Davis Cup, Serbia at United States, doubles match, Tennis Channel, noon-3 p.m. (live), 3-6 p.m. (repeat). Monterrey (women), semifinals, Tennis Channel, 8 p.m.-midnight (delay). Charleston (women), final, ESPN2, 10 a.m.-noon (live). Davis Cup, Serbia at United States, two singles matches, Tennis Channel, 11 a.m.-5 p.m. (live), 5-8 p.m. (repeat). Monterrey (women), final, Tennis Channel, 8-10 p.m. (delay). USF def. Hawaii 4-3 in San Francisco. No. 1 singles: Thai Tu (USF) def. Jared Spiker 7-5, 6-4. Team records: USF 9-5-1, Hawaii 5-10. Pacific def. Hawaii 4-3 in Stockton. No. 1 singles: Xenia Suworowa (H) def. Iveta Masarova 0-6, 6-2, 6-4. Team records: Pacific 7-10 overall, 2-3 Big West Conference; Hawaii 3-7, 2-3. Friday-Sunday -- Davis Cup quarterfinals, Serbia vs. United States in Boise, Idaho, www.daviscup.com.